1937-1940 Eugenia Teen Girl doll, 18"
Photo courtesy of Andrea, Andy. 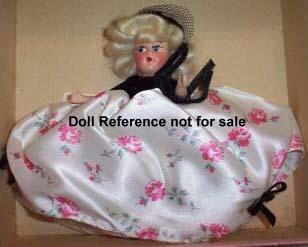 Not much is known of the Eugenia Doll Company - except that they operated in New York City. They may have purchased dolls from other manufacturers, that they redressed, composition dolls have been found with dress label, tag from as early as 1938 - and later hard plastic dolls into the 1950s. 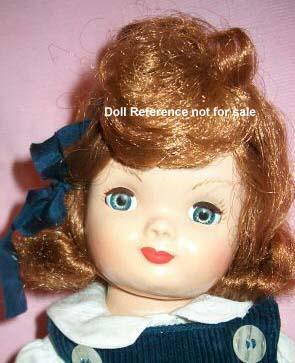 We don't have actual dates for this company but seems they stopped producing dolls in the 1950s. 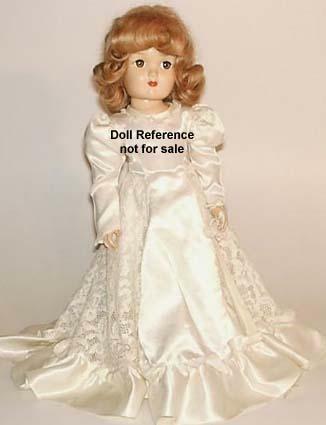 The few dolls that seem to come to the secondary market today are often dressed as brides so that may have been their specialty, most dolls are unmarked, but original clothing will have an Eugenia tag. A young Irene Szor began her design career here ca. 1947, after several years the company went bankrupt, at which time she went to work for the Sayco Doll Company. See the many vintage Eugenia dolls identified below. 1937-1940 Eugenia Juliette Bride Doll, 18" tall, all composition jointed body, blue sleep eyes, real upper lashes, painted lower lashes, mohair wig in several colors, dressed as a bride doll, several different bride outfits may have been available and the doll was offered for several years possibly into the early 1940s. 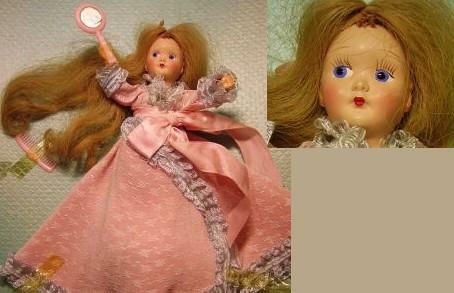 Doll may have been purchased, redressed and sold by Eugenia from Arranbee's, R & B's 18" Debu'teen mold (doll is unmarked), as it seems to have the same or similar face mold and upper eye lid. See below next two dolls. 1937 Juliette Bride doll, 18"
1937-1940 Eugenia Teen Girl doll, 18" tall, all composition, jointed body, mohair wig, sleep eyes, closed painted mouth, tagged Eugenia clothing. 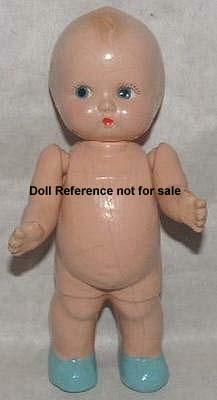 Doll is unmarked. 1937 Teen Girl doll, 18"
Photo's courtesy of Andrea, Andy. 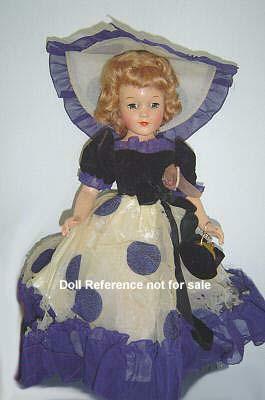 1938 Eugenia Johnnie doll, 10" tall, all composition jointed body, molded and painted hair, sleep eyes. Doll is unmarked but pants have a Eugenia tag/label. 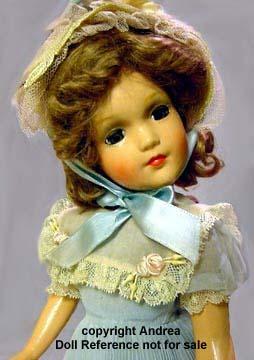 This doll was also sold as a set of twins; Janie doll & Johnnie 10, 12 & 14" tall that came with a trunk & clothing. 1948 Eugenia Dolls of the Week & Bridal Series Dolls, 6-7" tall, all composition jointed at shoulders & hips, painted eyes & upper lashes, mohair wig, closed mouth. Marks: unmarked. The box may give the only clue to the doll, manufacturer & which series she belonged too. Similar to the small Hollywood dolls. 1948 Eugenia New Baby Beloved doll, 7" tall, all composition, painted side glancing eyes, painted upper lashes, molded hair with painted wisps on top and a little on the sides, jointed at neck & shoulders, molded Union suit & painted blue molded shoes. Would have been dressed in a white batiste long gown with a ruffle at the bottom & matching bonnet. Marked: Eugenia/Doll. 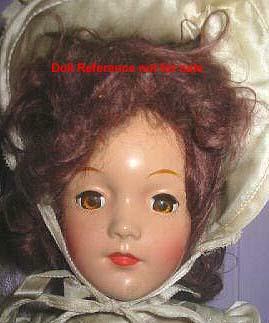 Doll is very similar to Horsman's Hebee & Shebee dolls. 1948 New Baby Beloved doll 7"
1948 Eugenia Personality Pla-Mate Dolls - Five dolls in the series, all were Montgomery Ward Department store exclusives. 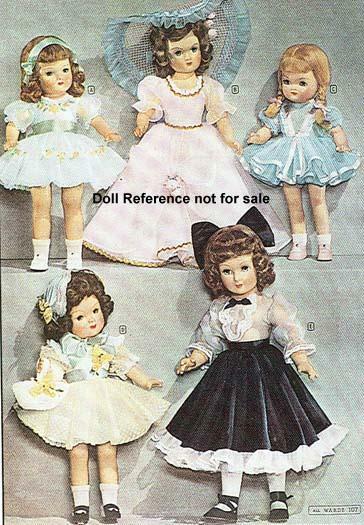 The dolls were: all composition are; Kathryn, Kathy, Sandra, Sandy and Roberta, Bobbie 15-16". All hard plastic Carolyn, Carol 18" and Barbara, Babs 20". Some of the composition dolls may also have been released in hard plastic versions, too. 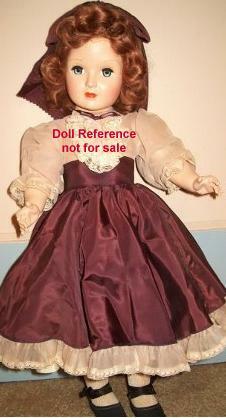 All dolls may be unmarked, they originally came with a hangtag that identified them. 1948 Eugenia Personality Pla-Mate Dolls Kathy or Kathryn doll 15-16" tall, all composition jointed body, sleep eyes, auburn mohair wig, pug like nose, closed red painted mouth. Kathryn has also been found made of hard plastic. 1948 Eugenia Personality Pla-Mate Carol or Carolyn doll, 18" tall, all hard plastic, sleep eyes, auburn mohair wig, in her original outfit. 1949 Eugenia Pam the Perm-O-Wave Doll, 14" tall, hard plastic, human hair wig, with Perm-O-Wave curlers, ". . these curlers can be used over and over again. These same curlers can give mother and daughter a home permanent", plastic makeup case, and barrette. 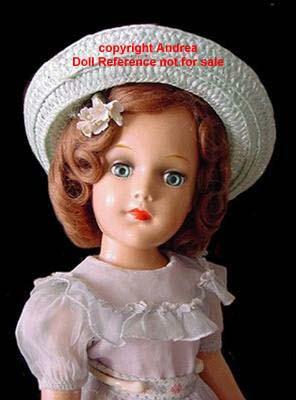 This was the earliest of the home permanent dolls and is classified as an "Advertising Doll". 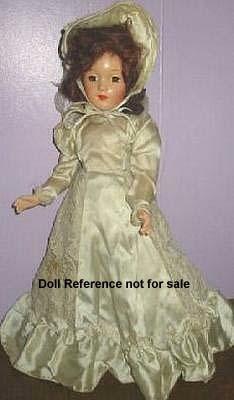 1950s Eugenia Juliette doll, 17 or 21" tall, hard plastic, sleep eyes, rooted hair, dressed as a Bride, by Eugenia Doll Co.